1- Active, Critical Learning Principle All aspects of the learning environment are set up to encourage active and critical, not passive learning. 3- Semiotic PrincipleLearning about and coming to appreciate interrelations within and across multiple sign systems ( images, words, actions, symbols, artifacts, etc.) as a complex system is core to the learning experience. 4- Semiotic Domains PrincipleLearning involves mastering, at some level, semiotic domains, and being able to participate, at some level, in the affinity group or groups connected to them. 5- Metalevel Thinking about Semiotic Domains PrincipleLearning involves active and critical thinking about the relationships of the semiotic domain being learned to other semiotic domains. There is a wide variety of web tools and mobile technologies to help teachers integrate the ethos of game-based learning in their classroom instruction. 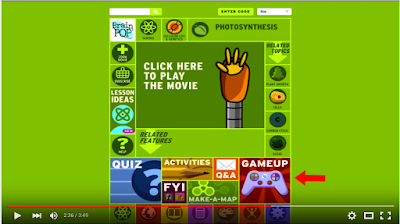 You can see examples of these tools from this page. 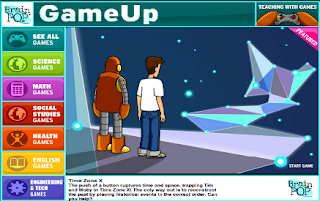 To these resources we add this excellent gaming tool from BrainPop called GameUp.